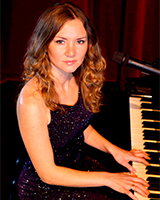 “My name is Natalia and I want to welcome you to my class (Piano/Vocal)"
I was born in the Ukraine and I have lived in the California for the past 8 years. 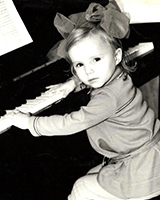 My passion for music started at age 4 when I was in Kindergarten. My teacher saw my musical talent during music and choir classes, and assigned me as a soloist of the choir group. I asked my parents over and over again to get me a piano. You could say I was obsessed. At age 5 and a half I got the piano but I had to wait until I was 6 years old to attend music vocational school, which is an 8 year program. During this interim time, I would compose my own melodies and find popular melodies on the piano. Performing with the jazz bands and the Orchestra. Singing world know classics, jazz and pop. After graduation I got the most desired job of sound engineer at the Audio-Recording production studio. This period of time gave me valuable professional training in the art of recording, and I quickly rose to the top of my profession in the local area. I became a recording artist doing voice over’s. I started to write jingles and advertisements for radio and TV commercials. I also completed a lot of projects for theater and solo music recording artists. I learned to write arrangements and sound tracks and work with modern audio recording software. At age 25, I felt very confident about my skills and experience. I made the decision that it was time to share my personal knowledge and spirit with others, and so I started to teach piano and vocals. I have been teaching ten years now. My many years of international performance experience gives me a unique set of skills to educate students with practical skills they will be able to apply in their own musical futures. My approach to teaching is a combination of formal technique and adaptive individualized style. Reading, technique, theory, and performance are the keystones of my curriculum. I create a fun and friendly learning environment and have so much to share. It makes me so happy to see the progress of my students. I can’t ask for more.
" WOW! What a GREAT JINGLE Natalia! You are remarkably talented. Thank You."